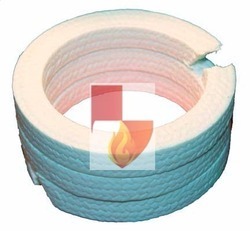 Pioneers in the industry, we offer heat sleeves, insulation tape, pyro jacket, insulation cloth, fabric insulation tape and ceramic fiber insulation from India. 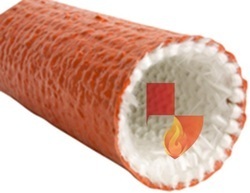 Smart- Shield’s Insulation Cloth are non-combustible when tested in accordance with BS 476, Part 4 are made from alumina-silica ceramic fiber, free of asbestos. These fiber materials can be used in different industrial applications under temperatures up to 1300°C and have excellent chemical stability and strong resistance to thermal shock and corrosion attack. 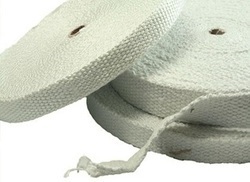 Inconel wire / SS wire and fiberglass filament are incorporated into the yarn to increase tensile strength of the fabrics both before and after exposure to heat. Typical applications for tapes include gaskets, seals, furnace and welding curtains or pipe wrapping. 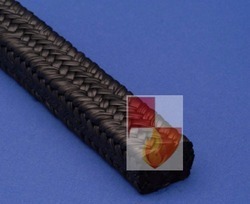 Flexible Graphite Pump Packing made of expanded yarns with a low chloride content reinforced with Inconel wires and coated with a graphite-based mix. contains a corrosion inhibitor to protect the valve stem and the stuffing box. This special structure withstands high pressures and gives frictionless sealing providing good life to the packing and Sleeve. 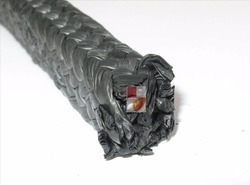 Smart- Shield’s Graphite Coated Kiln Rope are non-combustible when tested in accordance with BS 476, Part 4 are made from alumina-silica ceramic fiber, free of asbestos. 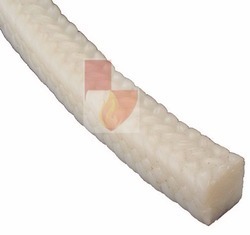 These fiber materials can be used in different industrial applications under temperatures up to 1300°C and have excellent chemical stability and strong resistance to thermal shock and corrosion attack. 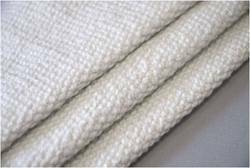 Inconel wire / SS wire and fiberglass filament are incorporated into the yarn to increase tensile strength of the fabrics both before and after exposure to heat. Typical applications for tapes include gaskets, seals, furnace and welding curtains or pipe wrapping. 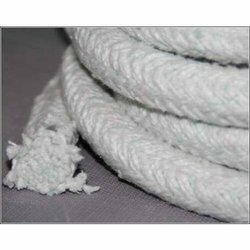 PTFE Rope is made from 100% virgin PTFE yarns with self- lubricating content for superior heat dissipation. This packing offers low coefficient of friction which ensures easy operation and actuation of any valve. The Packing needs no external Lubricant, no Oil, and has no chance of burning. Smart Shield manufactures removable insulation blankets for steam and gas turbines of all shapes and sizes. 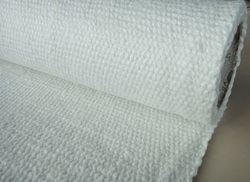 Depending on safety & Temperature requirements, these blankets can be up to 4" thick. 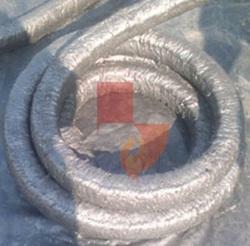 We provide flexible insulation wrap that will cover the turbine, power piping, valve bodies, exchanger heads, pressure vessels and process piping that may have been missed or rebuilt. Flange Covers are integral parts of many material transport systems in plants all over the world. Flanges, or internal or external lips and rims, are used to mount or strengthen connections between pipes. The term can be something of a catch-all in day-to-day usage, but in industrial terms flanges are fairly straightforward, serving as connection points between material transport pipes. Unions also serve as connection points, except they are designed to be easily disconnected for maintenance or replacement. Because connection points in steam, gas, and water systems undergo disproportionate stress, and because of their unusual shapes, plant owners have a tricky situation when creating their insulation plan for a system with flanges and unions. The unique shapes these components can take on as well as the need to access them for repairs means that any inflexible insulation plan is out of the question. This can further complicate things, since a plant owner might decide to insulate other system components and ignore the flanges and unions in their system. This approach can put even further stress on those components, however, and can lead to a system failure. Therefore, removable flange insulation is recommended. SMART SHIELD Jackets has created a versatile removable insulation jacket solution for flanges and unions in plant systems. This means a more stable system for the plant operator and less stress on critical components like unions and flanges. The Right Fit:Good insulation practices have insulators insulating 3 inches back from all unions and flanges. A standard removable jacket for flanges is usually 8-10 inches long. This will allow maintenance to remove the jackets and access the flange bolts without damaging the adjacent hard insulation. Convenient: Because of SMART SHIELD Jackets’ flexible design, access to remove, maintain and adjust these components does not have to be sacrificed. Most of our jackets can be removed and replaced in mere minutes. Cost effective: A fully insulated system provides a measurable return on investment for operators – meaning they pay for themselves over time. SMART SHIELD provides the exact product you need, so you do not pay for unnecessary components. 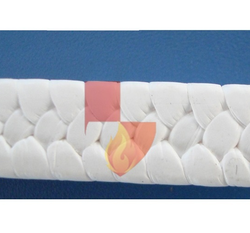 Smart shield Thermal Insulation Fabric for gas/steam turbines and conveyors. This thermal insulation fabric suitably modelled for optimal coverage; smart shield provides a turnkey product for direct use on-site, with clear assembly instructions. The company's textile department is capable of creating complex forms for the most diverse surfaces. The use of specific technical materials combined in multi-layers allows for reducing heat by up to 1200°C, for maintaining the process temperature and/or for personal protection. Smart- Shield’s ASBESTOS LUBRICATED GRAPHITE PACKING are non-combustible when tested in accordance with BS 476, Part 4 are made from alumina-silica ceramic fiber, free of asbestos. These fiber materials can be used in different industrial applications under temperatures up to 1300°C and have excellent chemical stability and strong resistance to thermal shock and corrosion attack. 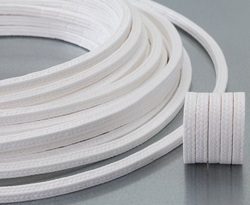 Inconel wire / SS wire and fiberglass filament are incorporated into the yarn to increase tensile strength of the fabrics both before and after exposure to heat. Typical applications for tapes include gaskets, seals, furnace and welding curtains or pipe wrapping. 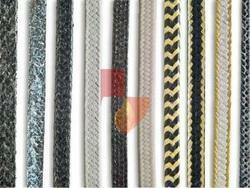 Braided Packing is Braided from 100 % Virgin PTFE Yarns which are then pre-treated with continuous graphite impregnation, it has self lubricating property which assists dissipation of heat, which ensures negligible hardness, no friction and hence results in minimal shaft wear. 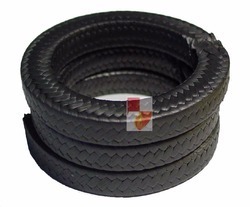 It offers an excellent sealing and reliability in high performance duties. ICP 936 have been specially treated to incorporate a high quality graphite based lubricant. Excellent lubricity and high thermal conductivity. An exceptional packing for centrifugal pumps, rotatives, turbines, agitator valves, mixers, dryers and refiners. 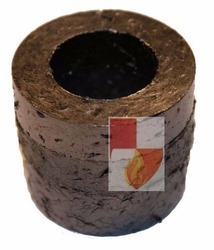 Suitable for a wide range of applications as metallurgical and chemical industry, paper & pulp, recycling plants, etc. Smart Shield's Cable Covers are available to protect the heating cable from slag and molten metal created during welding. 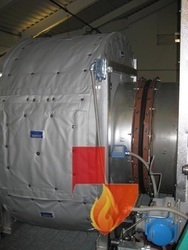 The preheat covers are easy to install and can withstand temperatures up 1650°C. Chevron Packing Seal made of expanded yarns with a low chloride content reinforced with Inconel wires and coated with a graphite-based mix. 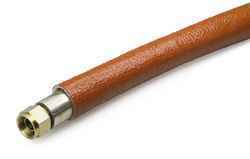 contains a corrosion inhibitor to protect the valve stem and the stuffing box. This special structure withstands high pressures and gives frictionless sealing providing good life to the packing and Sleeve. GRAPHITE PUMP PACKING made of expanded yarns with a low chloride content reinforced with Inconel wires and coated with a graphite-based mix. contains a corrosion inhibitor to protect the valve stem and the stuffing box. This special structure withstands high pressures and gives frictionless sealing providing good life to the packing and Sleeve. Smart-Shield Isolating gasket system is designed for general applications where electrical flange isolation and corrosion control are required on pipes containing gas, natural gas, oil, water/wastewater, and other hydrocarbon based medias to increase the effectiveness of cathodic protection systems. Available for flat face, raised face and ring type joint flanges. For complete isolation, sleeves and washers are needed with an isolation gasket. 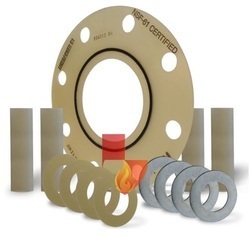 To isolate connecting flanges and protect the gasket and flange from corrosion, Smart-Shield provides sleeve and washer sets to complete the isolation system. The sleeves and washers prevent current from reaching the bolts/studs and nuts. Application of Flange Insulation Gasket kits. To limit the extent and cost of cathodic protection current to only those pipes that need to be protected from the main cathodic protection system. To electrically "split up" long pipelines into distinctive cathodic protection systems. To isolate a pipeline to ensure that cathodic protection or stray electricity currents do not cause increased corrosion, or cause a hazard. To isolate piping systems where dissimilar metals are present. 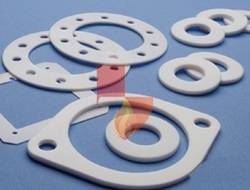 PTFE Gasket is made from 100% virgin PTFE yarns with self- lubricating content for superior heat dissipation. This packing offers low coefficient of friction which ensures easy operation and actuation of any valve. The Packing needs no external Lubricant, no Oil, and has no chance of burning. 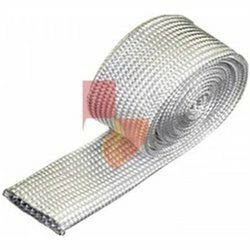 This is Braided from 100 % Virgin PTFE Yarns which are then pre-treated with continuous graphite impregnation, it has self lubricating property which assists dissipation of heat, which ensures negligible hardness, no friction and hence results in minimal shaft wear. 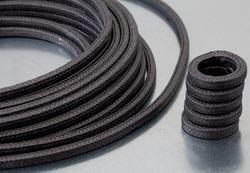 PTFE Oil Seals is made from 100% virgin PTFE yarns with self- lubricating content for superior heat dissipation. This packing offers low coefficient of friction which ensures easy operation and actuation of any valve. The Packing needs no external Lubricant, no Oil, and has no chance of burning. 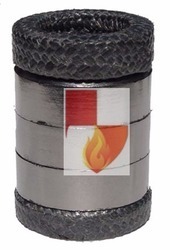 This gland packing is made from 100% virgin PTFE yarns with self- lubricating content for superior heat dissipation. This packing offers low coefficient of friction which ensures easy operation and actuation of any valve. The Packing needs no external Lubricant, no Oil, and has no chance of burning. PTFE Pump Packing is made from 100% virgin PTFE yarns with self- lubricating content for superior heat dissipation. This packing offers low coefficient of friction which ensures easy operation and actuation of any valve. The Packing needs no external Lubricant, no Oil, and has no chance of burning. 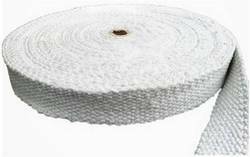 PTFE Valve Packing is made from 100% virgin PTFE yarns with self- lubricating content for superior heat dissipation. This packing offers low coefficient of friction which ensures easy operation and actuation of any valve. The Packing needs no external Lubricant, no Oil, and has no chance of burning. 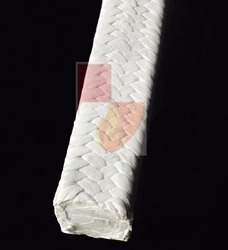 Valve Braided Packing is Braided from 100 % Virgin PTFE Yarns which are then pre-treated with continuous graphite impregnation, it has self lubricating property which assists dissipation of heat, which ensures negligible hardness, no friction and hence results in minimal shaft wear. Valve Covers are integral parts of many material transport systems in plants all over the world. Valve, or internal or external lips and rims, are used to mount or strengthen connections between pipes. The term can be something of a catch-all in day-to-day usage, but in industrial terms valve are fairly straightforward, serving as connection points between material transport pipes. valve also serve as connection points, except they are designed to be easily disconnected for maintenance or replacement. Because connection points in steam, gas, and water systems undergo disproportionate stress, and because of their unusual shapes, plant owners have a tricky situation when creating their insulation plan for a system with valve. The unique shapes these components can take on as well as the need to access them for repairs means that any inflexible insulation plan is out of the question. This can further complicate things, since a plant owner might decide to insulate other system components and ignore the valve in their system. This approach can put even further stress on those components, however, and can lead to a system failure. Therefore, removable valve insulation is recommended. SMART SHIELD Jackets has created a versatile removable insulation jacket solution for valve in plant systems. This means a more stable system for the plant operator and less stress on critical components like valve. The Right Fit:Good insulation practices have insulators insulating 3 inches back from all valve. 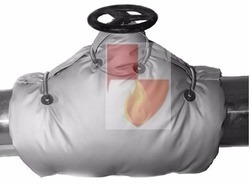 A standard removable jacket for valve is usually 8-10 inches long. This will allow maintenance to remove the jackets and access the valve without damaging the adjacent hard insulation. Looking for Miscellaneous Product - 1 ?